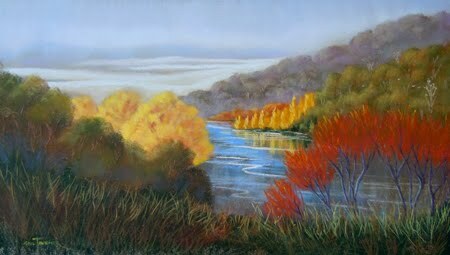 A crisp Autumn morning is enough to get the inspiration churning and the pastels working overtime. This painting is a recent studio piece inspired by photos taken last year around Bright, Myrtleford and the Ovens River area. You can view this work at Bendigo Pottery from 12th.March, 2011 until 28th. April (unless it is sold in the meantime)- Priced at a very reasonable $595.00, the frame size is 20 inches x 30 inches.